A collection of 22 bones, the skull protects the all-important brain and supports the other soft tissues of the head. During fetal development, the bones of the skull form within tough, fibrous membranes in a fetus’ head. As these bones grow throughout fetal and childhood development, they begin to fuse together, forming a single skull. 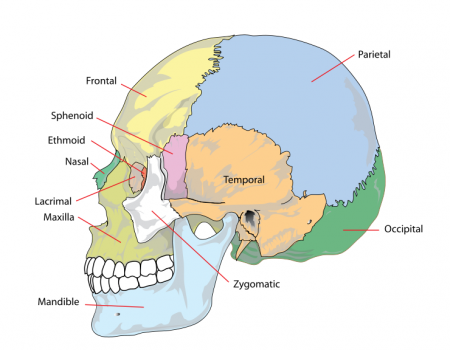 The only bone that remains separate from the rest of the skull is the mandible, or jaw bone. Early separation of the bones provides the fetal skull with the flexibility necessary to pass through the tight confines of the birth canal. During childhood development, the skull bones remain somewhat separated, allowing for growth of the brain and skull. Upon reaching maturity, our skull bones fuse to produce a rigid protective shell for the soft nervous tissue of our brain. Collectively, these bones provide a solid bony wall around the brain, with only a few openings for nerves and blood vessels. Our occipital bone contains the foramen magnum, the hole through which the spinal cord enters the skull to attach to the brain. The occipital bone also forms the atlanto-occipital joint with the atlas (the first cervical vertebra in our spine). The frontal, ethmoid, and sphenoid bones contain small hollow spaces known as paranasal sinuses. The sinuses help to reduce the weight of these bones and increase the resonance of the voice during speech, singing, and humming. The mandible, or jaw bone, is the only movable bone of the skull, forming the temporomandibular joint with the temporal bone. The lower teeth are rooted into the mandible while the upper teeth are rooted in the two maxillae. The maxillae also contain paranasal sinuses like the frontal, ethmoid, and sphenoid bones of the cranium.